A great set of questions about Kindle Unlimited with great answers. Amazon launched Kindle Unlimited on Friday, giving self-publishers a big decision to make. 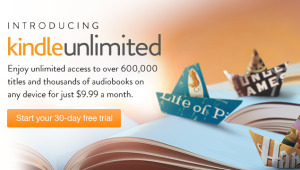 The long-rumored subscription service will allow users to download unlimited books for $9.99 a month, and reader reaction has been, from what I can see, overwhelmingly positive – especially because they will be able to test the service with a month’s free trial. Writers have been a little more cautious, for all sorts of reasons I’ll try and tease out below. The main stumbling block for self-publishers is that participation in Kindle Unlimited is restricted to titles enrolled in KDP Select – Amazon’s program which offers various additional marketing tools in exchange for exclusivity. Author compensation will be similar to borrows under the Kindle Owners’ Lending Library – a percentage of money from a fixed pool. The only real twist is that payment will be triggered when 10% of downloaded books have been read.